March 2003, Martha Kohlmeyer of Odin Persians passed away after a long battle with cancer. Martha will always be remembered as one of the pioneers of lilac Persians. Odin Persians traces its beginnings to a breeding of a black male to a blue cream female that produced unexpected results - a male kitten with the most unbelievably beautiful lilac color! Genetically, he was a 32-1 longshot. Martha named her surprise kitten Odin's Lilac Leopold. Although Leo's type was only breeder quality, his color was awesome. To promote Lilacs, Martha decided to show Leo in 1990 so that judges could appreciate what excellent lilac color in a Persian should look like. Using Leo as a foundation, Martha then took on one of the greatest color challenges in Persians. 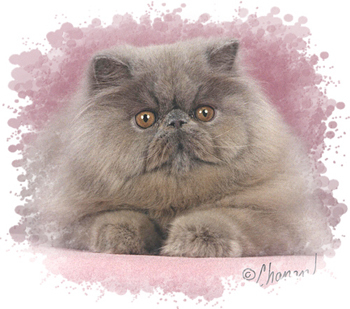 Incorporating both solid and Himalayan Persians into a carefully planned program she worked through several generations towards her goal of grand quality lilac and chocolate cats. 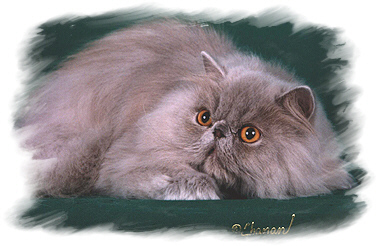 In 1996, her dedication was rewarded and her joy was unbounded when GC Odin Destiny became CFA's first male lilac Grand Champion Persian and the second lilac grand ever. 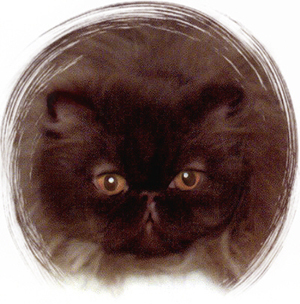 Odin Persians became part of CFA breed history. Destiny was then retired from the show ring to began his breeding career. It was not long before he sired a gorgeous lilac daughter. Remembering the long journey it took to produce the little girl, Martha chose a special and meaningful name for the little girl... and the kitten grew up to earn her Grand title and eventually become known as GC Odin Stop and Smell the Roses. Rosie granded in 1998 and was National Best Lilac for the 1997-1998 show season in CFA. Martha was on cloud nine. Destiny also had a full sister who was a chocolate. In 1999 Martha brought this beautiful girl to the show ring as a spay. GP Odin Quantum Leap granded quickly to become Odin's first chocolate grand. Destiny, Rosie and QL were the culmination of Martha's program. Breeding lilac and chocolate Persians takes a deep understanding of genetics... and lots of patience. Show quality results often take generations to produce. Because there were few show quality lilac Persians, Martha needed to keep introducing non-lilacs to her lilac or chocolate carriers to improve type in her cats. It meant a step backwards in order to eventually take a step forwards. It was years before Martha could finally breed a lilac to a lilac. But Martha remained dedicated to her passion. Her long term, focused goal set an example for each and every breeder who knew her. She made many friends along the way and left her mark, in lavender tones, on the history of Persians in CFA. Thank you, Martha. You will be missed. so if you are interested you are welcome to stop by and trace back your pedigrees.